President Obama stepped forward onto the White House porch yesterday, as per tradition, to pardon a turkey for the Thanksgiving season. This year however, the President in what will be his last pardoning chose instead to pardon Sonic Boom. The Wii U and 3DS title (as opposed to the promising and highly enjoyable comic and television series of the same name) has been widely panned across the video game community for its broken mechanics, dull gameplay and repetitive characters. 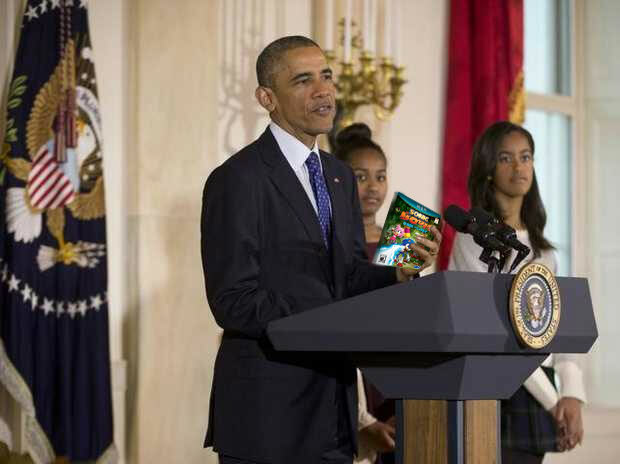 Obama brandishing Wii U title “Sonic Boom: Rise Of Lyric” at the ceremony as his unimpressed daughters look on. Obama’s radical action has effectively saved the games from being violently attacked by frustrated American gamers with knives, forks and other sharp impliments. What will come of the games now is not clear but it is believed they will be given their freedom and placed in the care of a Tampa based Youth Club. We can only hope for the youth club not having any current gen Nintendo consoles.